Randolins is situated on the unique Suvretta hillside, one of the most beautiful places in St. Moritz. 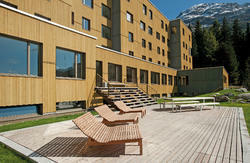 Our two Backpackers guesthouses lie in the middle of the paradise of the Engadin Mountains. Our location is a wish come true for active recreation and sport activities. On the one hand, it is directly by the ski slopes and hiking trails, on the other it lies in absolute tranquility with a suitable amount of comfort, refined cuisine, and a fabulous view. Randolins Backpackers is a real insiders tip for those who like to spend the night in simple and affordable accommodations without missing out on the opportunity to enjoy the comfort of our wellness oasis and the services of our 3* Hotel! All of our guesthouses are available to individual guests and groups of all kinds 365 days a year. Coming from the direction of Chur on the A13, take the Thusis South exit. Continue on the Julierpass Street in the direction of St. Moritz to Silvaplana. From there, go approx. 1.5km in the direction of St. Moritz. Take the turnoff to the left in the direction of ChampfÃ¨r/Suvretta. Pass the small town of ChampfÃ¨r. After approx. 1km there is another turnoff (Somplaz) to the left towards St. Moritz Suvretta. From here, Randolins is marked on the local signs. With the SBB (Swiss Federal Railways) you go to Chur. In Chur you change the train. After a magnificent 2 hour journey you arrive in St. Moritz. We will pick you up at the train station at 17.00 or 18.00 o'clock. Please tell us your arrival time as soon as possible. Maybe there are other times possible.